The storm is responsible for at least 6 deaths. Thousands of flights have been canceled. The storm caused hundreds of crashes. Power was knocked out to tens of thousands of customers. As Winter Storm Harper pushed into the Northeast Sunday, the storm left behind a trail of thousands of flight cancelations, hundreds of crashes and at least six people dead. 2,800 in Virginia as of 4:45 pm, according to PowerOutage.us. In addition to ice and snow, several states were dealing with coastal flooding on Sunday. 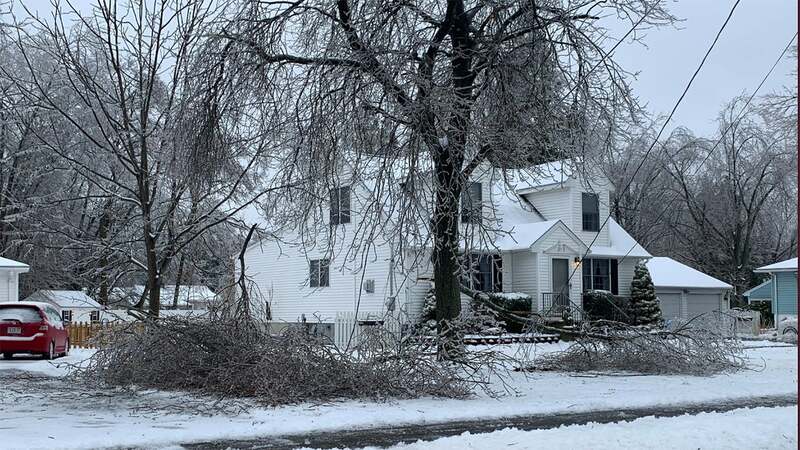 A falling tree killed a utility subcontractor about 3:15 p.m. Sunday in Middletown, Connecticut, WVIT reported. Middletown Police said the Eversource subcontractor had repaired a line when the tree fell on him. His name was not released. On Saturday, a Kansas Department of Transportation worker was killed in a crash during snow removal operations on southbound U.S. 69 in Johnson County. The driver was identified as a 25-year-old Stephen Winder. He died after the rig he was driving rolled over around 6 a.m. local time. Winder was reportedly thrown from the vehicle, which then landed on top of him. The crash is under investigation. The Missouri State Highway Patrol reported two deaths from weather-related crashes. Two lives in California earlier this week. A United Airlines jetliner slid off the runway Saturday morning after landing at O'Hare International Airport, the Chicago Tribune reports. No one was injured when United Airlines flight 656 from Phoenix to Chicago rolled off the concrete surface into a grassy area. On Friday, Southwest Airlines 1643 sled off the runway at Eppley Airfield after landing about 2:05 pm local time, according to the Omaha World-Herald. Freezing drizzle was falling at the time. The airport, which closed for several hours because of the accident, tweeted : "There are no injuries and airport fire crews are working with Southwest to the plane and passengers. take them to the terminal. " " "It seemed like it would be OK, but then we were slowing down to turn, you could feel them trying to get the brakes going and it was just too slick. So we ended up off the runway in the grass, "Ali Schwanke tweeted Friday. From about 6 p.m. Saturday until about 7:30 PM Police responded to 72 crashes, some with minor injuries. Troopers assisted 133 motor vehicles whose vehicles had spun out, gotten stuck or broke down. Snow and sleet were also causing power outages in the state. More than 30,000 customers were without electricity as of 3 p.m., PowerOutage.us reported. There were a number of reports of trees falling over power lines. The speed limit alongs parts of the Massachusetts Turnpike were reduced to 40 mph because of the weather the Massachusetts Department of Transportation announced. The reduction was in effect from the New York border to Wilbraham and from Hopkinton to Weston. Exit 14 on Interstate 93 in Boston was also closed because of tidal flooding. New York  Tractor-trailers and buses ET Saturday. "Safety is our number one priority and with the anticipated storm impact of New York State, we are implementing this tractors and buses so our plow operators, fire, law enforcement and emergency personnel can keep roads clean and responded. to emergencies as quickly as possible, "Cuomo said. "I too urging drivers to stay off the roads unless absolutely necessary." All train service into and out of Pittsburgh were stopped Sunday morning after overhead power lines were frozen, the Port Authority of Allegheny County tweeted. The Pennsylvania Department of Transportation temporarily reduced the speed limit to 45 mph on several highways in Allegheny, Beaver, and Lawrence counties because of the hard freeze early Sunday morning. At least five Ohio counties instituted Level 3 snow emergencies on Saturday WKYC reported. Roadways were closed to all non-emergency travel in Erie, Huron, Sandusky, Ottawa and Crawford counties. Lorain, Summit, Medina, Wayne, and Ashland counties were at Level 2 which meant that only people who thought it was necessary to drive on the roads. US. 24 was closed near Napoleon, Ohio after a big rig ride off the road and blocked lanes. At one point Sunday morning, more than 13,000 Ohio customers were without power, according to poweroutage.us. The storm caused travel woes across the Plains on Friday as it pushed toward the Midwest. A 15- vehicle pileup on Interstate 55 near Thayer, Missouri, which temporarily closed a section of the interstate in the southeastern side of the state. The Missouri State Highway Patrol reported 1608 service calls 575 stranded motorists, 285 crashes and 43 injuries in addition to the two fatalities. Michael J. Fox, 48, or Sunrise Beach, Missouri, died when his Polaris off-road vehicle ran off the road and rolled over at 12:40 am James Haase, 30, or Already Spring, Missouri, was killed when he lost control of his Honda Accord on a snow-covered Route OO near Kimberling City. it slid into the path of an oncoming pickup truck shortly before noon, according to the highway patrol. The Minnesota Department of Transportation said Saturday at least five snowplows had been hit by passing vehicles in the past 24 hours. A jackknifed semi-trailer truck shut down part of Interstate 35 in Minnesota on Friday afternoon from the Clarks Grove exit to near Albert Lea, the Albert Lea Tribune reported. It was one of the number of crashes affecting traffic on I-35 and Interstate 90. The Kansas Highway Patrol said there were several crashes and vehicles sliding off the road on Interstate 70 in Geary and Riley counties. . The interstate was partially blocked near mile marker 316. No injuries were reported after a vehicle collided with a snowplow Friday on a South Dakota road. "Early this morning a driver tried to pass a snow plow and collided with the wing blade in a white out, "The South Dakota Highway Patrol tweeted Friday. "Now we have 1 less (snowplow) to clear the road. Poor driving decisions affect us all!" Friday afternoon, a second snowplow was hit by a car. No injuries were reported in that crash. In Nebraska, numerous spin outs were reported on I-29 outside Omaha, including three tractor-trailers that slid into ditches. Amtrak announced Friday that it would be modifying its service in the Midwest and Northeast because of the storm. Winter Storm Harper Latest Forecast On Sunday, five Acela trains and six Northeast Regional trains are canceled between New York and Boston. Six keystone trains will not operate between New York and Harrisburg, Pennsylvania. Two Pennsylvania trains between New York and Pittsburgh are canceled. Two Vermonter trains on Sunday will not operate between St. Albans, Vermont, and New Haven, Connecticut, the Associated Press reports. Service between New York and Washington will run as scheduled. In anticipation of the storm, airlines including American Southwest United and Frontier are waiving change fees for cities impacted by the storm.